This is a PAID game, but you have the opportunity to try it before you buy. 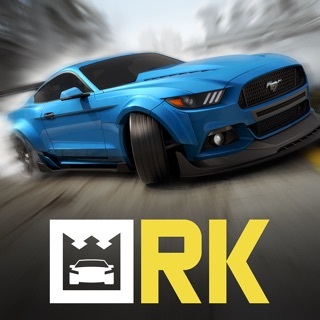 Enjoy 5 tracks and 2 cars for free to experience one of the "BEST OF 2015". • App Store "EDITORS' CHOICE"
Horizon Chase is a love letter to all retro gaming fans. It's an addictive racing game inspired in the great hits of the 80's and 90's: Out Run, Lotus Turbo Challenge, Top Gear (SNES), Rush, among others. Each curve and each lap in Horizon Chase recreate classic arcade gameplay and offer you unbound speed limits of fun. Full throttle on and enjoy! Horizon Chase brings back the graphic context of the 16-bit generation and creates a style that is inspired in the past without letting go of its contemporaneity. The apparent polygon and secondary color aesthetic accentuate the visual beauty of the game, resulting in a unique and harmonic atmosphere. You'll feel the retro soul of the game on a completely modern body. Horizon Chase is a race around the world. With each new cup you'll pilot your car through extraordinary places, watching the sun setting, facing rain, snow, volcanic ashes and even severe sandstorms. Be it day or night each track takes place in beautiful postcards from across the world. Horizon Chase presents Barry Leitch, the musician behind the soundtracks of classic arcade racing games Lotus Turbo Challenge, Top Gear (SNES) and Rush. As you play the game, you'll be hypnotized by his charming tunes that compliment the graphical ecstasy of each horizon. - Try it before you buy: enjoy 5 tracks for free! A beautiful modernization of old-school racing, Horizon Chase is all about the rush of pure speed as you whip though corners and snag power-ups. It pays homage to classics like Pole Position and Out Run with an inventive visual style that looks both nostalgically retro and unmistakably contemporary. But what we loved most is how collisions always slow you down, so it takes a nimble touch and a clean line to surge to the front. I’ve had this game for about a year now but I mainly played it on my iPad before I downloaded it on my phone. The graphics of the game are phenomenal better than any racing game I’ve seen on the App Store! The tracks are very creative and the cars are just awesome! One problem I have with this game is that it’s constantly crashing... There are times when I launch the app and the game just crashes on start up. There are other times when I put my phone on sleep mode and leave the app in the background running and when I go and start playing again it just crashes which is really annoying. Another thing, one time I was playing the game and racking up my points to unlock the cups and bonus races. Not even 1 hour into the game and I crashes and I lost all my data that I saved in the last 15 minutes. I was mad to reopen my game and notice that the wins I had saved were gone. I just hope that this gets fixed cause I don’t want to have to go through the crashes again! Thank You.